Today I was in a real hurry this morning so I just slapped on some minimal make up, and even forgot to do my brows. Only realized when it was the end of the day – oops. By the way, I look very pale in this picture, not sure why, must because of the sun outside. Yes there is sun, only for now. The weather forecast is predicting lots of rain starting Thursday. And yes, autumn is also coming to Paris! After uni I went to Saint-Lazare, which is one of the largest metro/RER/train stations in Paris. 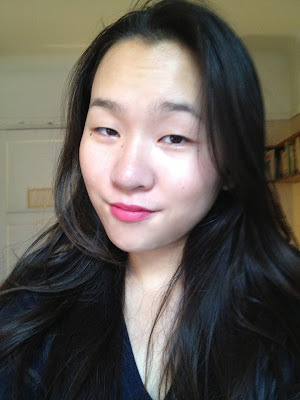 It’s very close to many shops, and I popped into Sephora to try some new lipstick colors. I was looking for red’s and orange’s but, this one appealed to me the most. Very chic, and didn’t made my teeth look yellow! I think this is the one… Definitely putting this on my “to buy list” when I go to the airport. Hello tax-free shopping! Oh, and then I went to buy a USB stick at FNAC, which was actually my intention for the trip. Ha ha, I’m hopeless when there is beauty around! Have you found your red lipstick yet? Previous Post Flash Sale at Cult Beauty – 25% off!